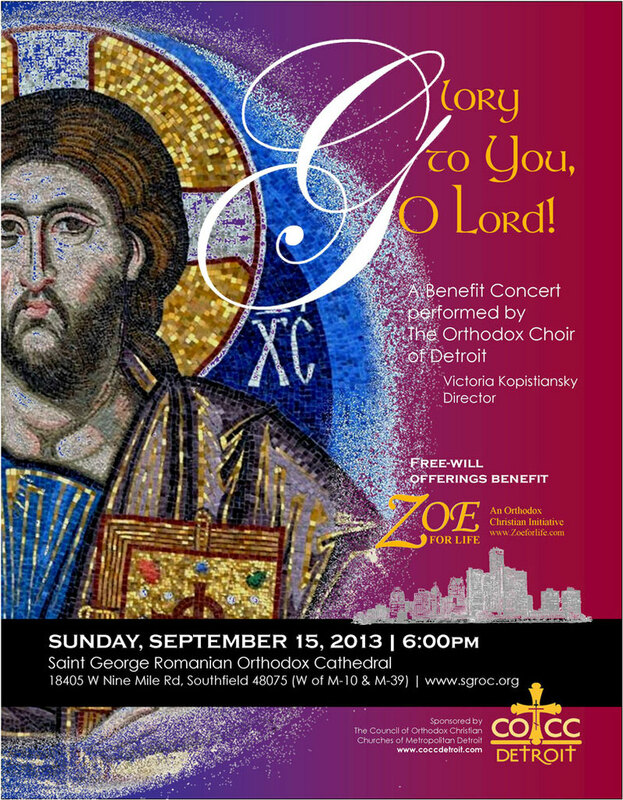 Council of Orthodox Christian Churches - COCC sponsors concert, benefits "Zoe for Life!" COCC sponsors concert, benefits "ZOE for Life!" DETROIT, MI [COCC] -- The Council of Orthodox Christian Churches of Metropolitan Detroit (COCC) sponsored a concert to benefit ZOE for Life! on Sunday, Sept. 15 at 6 p.m. at St. George Romanian Orthodox Cathedral, 18405 W. Nine Mile Road, Southfield. The concert program consisted of Orthodox hymns and songs of worship performed by the Orthodox Choir of Metropolitan Detroit conducted by Matushka Victoria Kopistiansky, artistic director. The Orthodox Choir is composed of volunteer singers from Orthodox parish choirs throughout Metropolitan-Detroit. In addition to special concerts and other selected events, the choir sings an annual series of Vespers services on the five Sundays of Orthodox Great Lent sponsored by the COCC. "Orthodox parishes across Detroit reach out to help others in many ways, and the COCC is expanding these efforts through the treasure of our music to bring greater awareness of our community and mission," Subdeacon John E. Lazar, president of the COCC, said. "This concert allows us to extend our hands and hearts to aid those in need, and make at least a small difference through needed funds and the spirit of Christian love." The concert was open to the general public free of charge. Donations were collected to support ZOE for Life! An afterglow followed the concert. ABOUT ZOE FOR LIFE! : Based near Cleveland, Ohio, ZOE for Life! is a non-profit Christ-centered support organization with three major goals: (1) to help women in crisis pregnancy; (2) to assist Orthodox Christian couples seeking to adopt; and (3) to create an Orthodox Christian abstinence program to educate young people. It is endorsed by the Standing Conference of the Canonical Orthodox Bishops in the Americas. For further information, visit its website at www.zoeforlifeonline.org.